His reluctance to believe what fellow disciples said about Jesus Christ’s resurrection earned him the name Doubting Thomas. Centuries later, St Thomas — believed to be the man who brought Christianity to India — finds himself in the shadow of ‘doubt’ with none other than the Pope contradicting his evangelical trek in the country, only to modify it a few days later. But far from dousing the fire, the Pope has rekindled a debate and given critics an issue on the platter. Pope Benedict XVI made the statement at the Vatican on September 27, 2006. Addressing the faithful during the Wednesday catechises, he recalled that St. Thomas first evangelised Syria and Persia, and went on to western India from where Christianity reached Southern India. The import of the statement was that St. Thomas never travelled to south India, but rather evangelised the western front, mostly comprising today’s Pakistan. 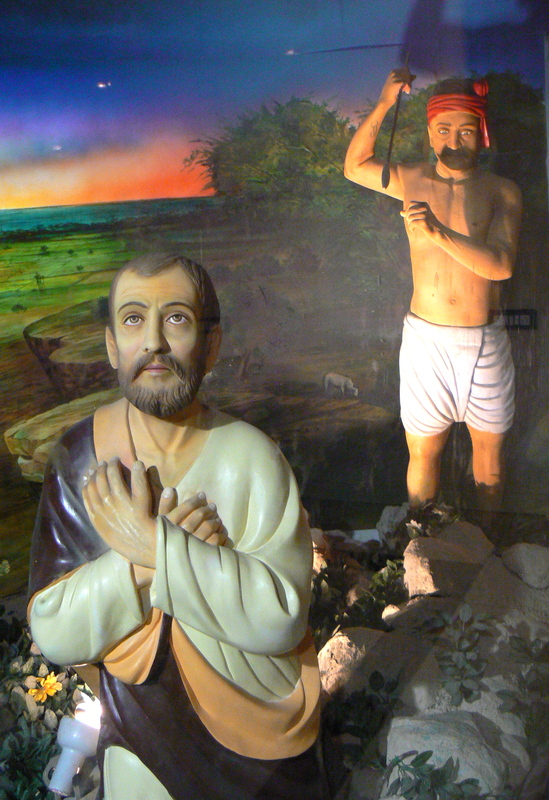 Knowingly or unknowingly, he had in one stroke challenged the basis of Christianity in India and demolished long-held views of the Church here that St Thomas landed in Kerala, where he spread the gospel among Hindus. The comments were especially a letdown for the Syrian Christians of Kerala, who proudly trace their ancestry to upper-caste Hindus said to have been evangelized by St Thomas upon his arrival in 52 AD. The comments went unnoticed until Sathya-Deepam, the official mouthpiece of the Syro-Malabar church, picked it up. Writing in it, George Nedungat, a member of the Oriental Pontifical Institute of Rome, conveyed the community’s anguish and claimed that previous popes had recognised St. Thomas’s work in south India. The Pope’s original statement given out at St. Peter’s, before it was amended on the Vatican website, was factually correct and reflected the geography of the Acts of Thomas, i.e. Syria, Parthia (Persia/Iran) and Gandhara (North-West Pakistan). There is no historical evidence to support the tradition that St. Thomas came to South India, and on 13 November 1952 Vatican officials sent a message to Kerala Christians stating that the landing of St. Thomas at Muziris (Cranganore now Kodungallur) on 21 November 52 AD was “unverified”. When this writer sought confirmation of the 1952 Vatican statement in 1996, the Vatican’s reply was disingenuous and non-committal. The Prefect of the Congregation for the Causes of Saints said that he needed more information and that the life of St. Thomas was the object of historical research and not within his Congregation’s competence. Earlier, in 1729, the Bishop of Madras-Mylapore had doubted whether the tomb in San Thome Cathedral was that of St. Thomas and wrote to the Sacred Congregation of Rites in Rome for clarification. Rome’s reply was never published and we may assume it was a negative reply. Again, in 1871 the Roman Catholic authorities at Madras were “strong in disparagement of the special sanctity of the localities [viz. San Thome, Little Mount, and Big Mount identified by the Portuguese after 1517] and the whole story connecting St. Thomas with Mailapur.” However, in 1886 Pope Leo XIII stated in an apostolic letter that St. Thomas “travelled to Ethiopia, Persia, Hyrcania and finally to the Peninsula beyond the Indus”, and in 1923 Pope Pius XI quoted Pope Leo’s letter and identified St. Thomas with “India”. These papal statements also reflect the geography of the Acts of Thomas, as does Pope Benedict’s statement, and make no reference to South India. In fact, the India they refer to is now Pakistan. Pope John Paul II visited India twice in 1986 and 1999 and prayed at the alleged tomb of St. Thomas in San Thome Cathedral, but, like St. Francis Xavier before him, he had nothing to say about St. Thomas’s visit to South India or Mylapore in the first century. This is a curious omission on the Pope’s part in that he was an ardent missionary who openly promoted the evangelising of India and Asia, and a statement from him confirming a visit by St. Thomas to South India would have certainly supported his agenda and that of his Indian bishops. As quoted in Deccan Chronicle, Chennai, of 23 November 2006, under the title “Pope angers Christians in Kerala”. Our letter to the Prefect, Sacred Congregation of Rites, Vatican City, dated 26 August 1996, read: “I am doing research on St. Thomas in India and have learned that your office issued a letter on November 13, 1952 which stated that the landing of St. Thomas at Cranganore in 53 AD is unverified. I would like to know if in fact the said letter was issued and, if that is not the case, whether you can confirm that St. Thomas was martyred and buried in Madras. I would be most grateful if you could direct me to any authentic evidence supporting the story of St. Thomas in India.” The reply from the Prefect, Sacred Congregation for the Causes of Saints, Rome, dated 11 September 1996, read: “This Congregation for the Causes of Saints has received your letter of 26th August last in which you have asked for information regarding Saint Thomas’ presence in India. We have not found in our Archives the letter supposedly written by this Congregation on 13th November 1952, of which you speak, because of a lack of more precise data (Diocese, destination, etc.). Nor do we have other data regarding Saint Thomas since this Archive was begun in 1588. His life is the object of the research of historians which is not the particular competence of this Congregation.” This reply was a brush off. The Prefect knew what we were asking for and could have located the 1952 Vatican letter in a few minutes if he wished to. This entry was posted in apostle, christianity, doubting thomas, history writing, indian history, ishwar sharan, madras, parthia, religion, san thome, santhome cathedral, st. thomas, thomas the apostle and tagged apostle of pakistan, apostle thomas, benedict xvi, chennai, hagiography, ishwar sharan, john paul ii, madras, mylapore, north west india, pakistan, parthia, saint thomas, san thome cathedral, satya-deepam, st. thomas apostle, vatican. Bookmark the permalink.